I have always been a fan of Kalki Fashion for bridal lehengas. They are one of the top retail lehenga stores in Mumbai. If your wedding lehenga budget is anywhere from INR 50k upwards to INR 1.2 Lakhs, Kalki Bridal 2018 Lehenga collection is worth checking out. Luckily for us, they have their very own online store as well, with every outfit prices and details uploaded. Recently Kalki showcased their 2018 bridal wear collection at Bombay Times Fashion Week. Disha Patani walked the show in a gorgeous red bridal lehenga that was every bit worth the price. When I first looked at the outfit, I couldn’t believe it was ‘reasonable’. Usually, showstopper looks are well beyond mass reach, but this one in particular was for every bride who dreams of a fairytale wedding. The Kalki Bridal 2018 Lehenga’s in this post range from INR 30k to INR 1.7 Lakhs. There are sarees, fusion ethnic wear, sister of the bride looks as well as pre-wedding outfits in this collection. Stay till the end to browse through every single outfit. Featuring melon pink raw silk lehenga intricate in multi colour resham embroidery, heavy ari and zardosi work. The lower bottom is adorn with heavy zardosi and resham embroidery in floral ,moroccan and temple embroidery. Comes with a matching deep v neck raw silk blouse in multi colour sequins and cut dana work. Paired with a contrasting mint green net dupatta with floral embroidered border. 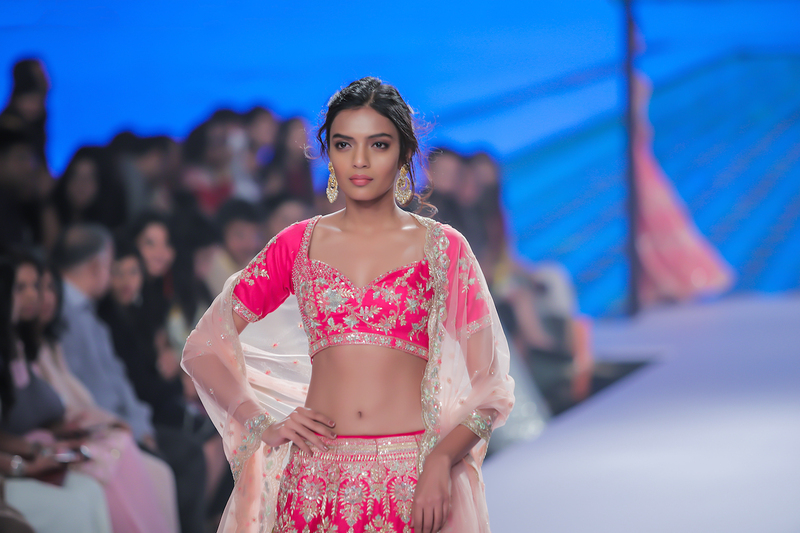 Traditional in its look, this gorgeous pink bridal lehenga is eternal. No matter what season, what year, this showstopper look will always be in fashion. The blouse of the lehenga with its deep V cut gives it a nice new look of sorts. By far my favourite bridal lehenga from Kalki fashion this year. The long sleeves are so in trend and look uber elegant and chic. The good part about wearing long sleeve blouses is that you can really show off that heavy embroidered blouse work. Intricate cut dana and zardosi embroidery on the top and has the lower bottom in cut dana, sequins, resham, zari, french knot and zardosi work in floral jaal embroidery. It has its hemline filled with intense cut dana embroidery along with moti and zardosi floral butti. Paired with a matching heavy embroidered deep v neck and back. Comes with a back hook and eye opening with tie up. Matched with a peach net dupatta in embroidered butti and border. To be honest, I wish we could see a variety of pinks and reds in bridal wear in this collection. This was their hero shade for bridal lehengas this year, and to be fair, it does look spectacular. But the wedding blogger in me always wants to see more. A good thing about seeing variations in the same shade of lehenga is that you can really choose with respect to style, heaviness of the outfit, and mostly price while shortlisting your dream lehenga. For those of you who are looking for something a bit more modern and unique in style, this gorgeous fuchsia pink lehenga with the contrast mint ruffles underneath is perfect for you. It’s priced pretty reasonably if you have a INR 1 Lakh budget and the outfit looks every bit bridal. I particularly like this lehenga for its jacket sheer dupatta look. Your hands can be free and you can pretty much dance all night fuss free. What’s also great about this look is that you can easily reuse the sheer jacket dupatta for any of your ethnic wear looks, and totally jazz it up. The last one in the hot pink, fuchsia lehenga list is this gorgeous corset lehenga with the gold jacket. Honestly, I think this is every bit worth it for the bride to wear as well for one of the pre-wedding functions. That or if you are a blessed sister of the bride/ sister-in-law with a healthy budget, this would be my pick for you then. Now, with pre-wedding outfits, you want to keep it light, easy on the eyes for some of the wedding functions. Light pinks, ivory, whites are trending this year. Some of my favourite looks from Kalki Bridal 2018 Lehengas for pre-wedding are listed below. Now, who doesn’t love a good old peplum jacket over a lehenga skirt. This is a gorgeous set for a cocktail party. Its a lace pink net lehenga with soft satin under layer. Embellished in abla work all the net in geometric motif. It comes with a lace pink strap bustier featuring in soft satin. I know of a lot of brides who love the floral look. This is a good piece on budget to invest in if you are a floral-floral girl. The powder pink shade is the most sought after colour this wedding season, and I can assure you finding budget pieces in trending colours is a big task. Ok, that corset might be a bit risqué, but overall the lehenga looks fantabulous. The little floral details on the bottom, the gorgeous full length cape sleeves, quite a powerful look to go for. Another variation to the gorgeous ivory lace peplum lehenga is this pretty baby pink raw silk lehenga. Paired with a multi panel raw silk choli in abla and resham work. Further enhanced with a long net embroidered jacket with front and side slit. Adorn with mirror and resham embroidery and butti. The lower bottom is further magnified with floral hues in cut dana, resham, moti and sequins embroidery. You know you are uber special at your siblings wedding. You got to look like a million bucks. This tulle lehenga will do exactly that for you. Dusty pink Paris velvet bustier with 3D hand embroidered neckline and shoulder. It comes with shoulder pads with sequins along with trail attached at the shoulder with tassel. Paired with a matching multi layered net skirt with Paris velvet lining. It comes with an additional net embroidered top layer in geometric hand embroidery. Aviary blue multi layered net lehenga. Embellished with 3D embroidered flowers and veils over the waist. Comes with sheer embroidered neck, back and sleeves , further enhanced the sleeves with cut dana tassels. Styled with a long net cape attached to the blouse adorn with cut dana floral butti. Personally, I love this one. Dainty, cute this elegant Anarkali can make anyone look their best on their big day. The sheer sleeves and the shade of the gown is beautiful to wear to a mehendi function at home. One of the more affordable pieces from Kalki Bridal 2018 Lehenga collection. This beautiful tulle lehenga may not be a bridal pick, but can look extremely buyable from a pre-wedding or a besties wedding perspective. It’s fun, playful and the delicate embroidery is the perfect balance for the outfit. Dusty pink embroidered net lehenga with pleated satin shimmer under layer. The upper half of the skirt is densely embellished in scattered sequins and moti hand work. Its further enhanced with cut dana and sequins butti in checks motif. Paired with an embroidered multi paneled corset blouse featured in net and velvet. Love this new shade from Kalki Bridal 2018 Lehenga collection. The beautiful mix of blues and pinks brings the whole look together and I absolutely love the embroidery on this one. What do you think? I think it would look perfect for a mehendi function or any other day wedding function. Another favourite form this years Kalki Bridal 2018 Lehenga collection is this gorgeous blue gold piece. The unique blouse design makes it a perfect pick for sangeet night party. It comes with a one shoulder dupatta drape that can’t be seen in the pictures above, but makes it super easy to carry off.